On Saturday, July 30th 2011 I awoke at 4:45am to run the Queens Half Marathon. I woke up in a terrible mood. I had wrapped late on a TV set, and crawled into bed at 1am. My Garmin was dead when I woke up, as my kitty had knocked it off the charger. After a long week of fantastic work, I was extremely sleep deprived. I hadn’t run since the race the previous weekend, as my left leg was still flaring up as an injury. I honestly didn’t know if I would cross the finish line running or crawling. I hadn’t run such distance since March, when I ran a marathon in Virginia. However, as I walked to the subway in the dark, I told myself that I had to change my attitude. I told myself that I could sleep after the race. I told myself that I needed to come to terms with the reality that I might not finish the race, but to just focus on a step at a time. I told myself that worse case scenario, this was another qualifying race for the 2012 NYC Marathon regardless of pace. Lastly, I told myself that I wasn’t going to disappoint anyone if I was slow, and that I would seriously disappoint myself if I ran stupid and re-injured myself. I was relieved to see Ben on the subway, and spending time with him before the race eased my nerves and lightened my bad mood. We started the race side-by-side, wishing each other a fantastic race. 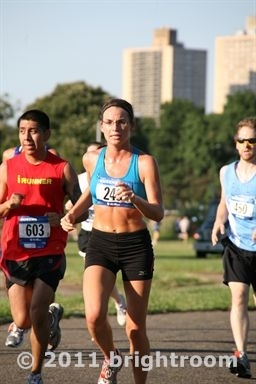 The weather was gorgeous, Corona Park was beautiful, and it was the perfect weather for a summer race. Running without my Garmin was interesting. I could guess my pace based on the time clocks at every mile marker, but I was instead forced to focus on my body and breath to set the pace. I held back my pace, trying to stay on my legs but to not push. I was trying to run a smart race on an injured leg. To my amazement, my leg felt fine! However, I am experienced enough to know that pain and injury can quickly raise its ugly head, and so I kept my pace slow. Since the race was contained entirely in the park, there were very few spectators along the race cheering on runners. I was a patient with myself as handfuls of female runners passed me. The competitor in me had to be suppressed, as I focused my myself and holding back for the sake of my leg. While quite races often affect my ability to focus, I was strangely calm and the miles clicked by smoothly. I was extremely surprised – and perhaps even dumbfounded, to cross the finish line setting a new Personal Record for the Half Marathon – 1:35:44. How could that be, with the odds being stacked up against me?!? What shocked me even more was that I still had no leg pain. Here are the stats, as recorded by NYRR. Female Place: 17th out of 2101 women! Age Place: 7th – I was SHOCKED!!! When I got home, I iced my leg and crawled into bed for a few hours. Unfortunately, my leg was very painful for the few days after the race. Part of the pain might have been contributed to a job I had modeling for three days, and time on my feet in heels is hard on the leg. ~ by Elizabeth on August 4, 2011.